Endless rope trainers (or rope resistance trainers) are probably the most effective way to train strength and endurance in the upper body and core. Since you are standing during training your legs have to work, too. Rope resistance training offers the highest time-under-tension and a constant but adjustable resistance for all pushing and pulling movements. revvll systems are extremely compact, light, and can be used almost anywhere. When the term rope pull fitness falls, most think of battleropes, rope climbing in the gym, train towers or other types of pulling apparatus. Hardly anyone thinks of an endless rope. But a rope trainer like the revvll is the perfect fitness machine for your rope pull fitness. The revvll endless rope trainers solve these problems of rope pull training. The biggest advantage of the revvll is its small size and mobility. The revvll rope trainers can be used indoors as well as outdoors wherever you have something to hang on. The revvll models come with an anchor sling and a karabiner. So you can hang on every rack, pole, climbing frame, trees and much more and the rope pull training can start directly. The pulling exercises are possible from above, in the horizontal and from below, as with pulling towers. The adjustable resistance of the endless rope trainers makes both excellent strength training and demanding endurance training possible. Partner exercises as shown in the picture are also possible with the revvll rope trainers. The adjustable resistance is a central element of the revvll in order to allow rope climbing for every trainee, whether they are rehab patients or professional athletes. At the same time, the adjustable resistance is an important part of training programming. If you prefer strength training you choose a higher resistance, if endurance is your main goal the lighter resistances will be your choice. It was an Olympic sport once, now you probably only know it from movies: rope climbing. Even though the surge of CrossFit has reinvigorated some of its former meaning, rope climbing is rareley seen in today’s training world. This has several reasons but it is a real shame because rope climbing is such a great exercise. Rope climbing, as you can practice with the revvll rope trainers, demands not only the back muscles, but also the shoulders, arms and grip strength. As one works with the entire body weight, a large expenditure of strength over a relatively long period of time is possible, which benefits endurance. There is also a coordinative aspect. In contrast to pull-ups, the rope does not offer an even hold, the neuromuscular requirements are much higher. In short: rope climbing is a prime example of functional training. But rope climbing is also dangerous due to its enormous height and is therefore hardly practiced nowadays. Training with the revvll rope trainers is much safer and the anti-allergenic endless rope is easier to clean than hemp or nylon ropes. There are rope climbing machines that allow the trainee to simulate rope climbing. However, these machines are big and heavy. The revvll was created to allow rope climbing everywhere and for every trainee. A positive side effect of the light weight is the fact that the revvll offers significantly more exercises. The revvll is integrated in our circuit training and supplements the functional training. Trainees of all ages can work with the revvll and that’s what makes it perfect for our circuit training. My favorite exercise is definitely pulling down with stretched arms – a great exercise for the triceps, too! Rope training is mostly performed in a stooping hip position. The revvll PRO is an innovative training tool that expands rope training with a multitude of other exercises. My clients, who spend a great portion of their day sitting, are not trained in this position but in an upright motion. And the revvll enables pushing and pulling movements in exactly this motion. The high manufacturing quality and the enormous mobility make the revvll one of a kind on the business. I must admit that the revvll is probably if not the best workout device ever in today’s fitness world. One of my best workouts with the revvll will be the biceps curl. Some will say the barbell curl might be the answer but I can argue that ’cause I workout with barbells too. However, I just discovered that the revvll is the best biceps builder and it gives you the fullest biceps pump ever. Train your strength and endurance with the revvll rope resistance trainer in intensive workouts. The high time under tension promotes blood flow into the musculature. The revvll is a so-called rope trainer. It allows for a training with a training rope that can be moved through the casing with different resistance settings. The revvll offers pushing and pulling movements as well as rotational exercises against a constant resistance. 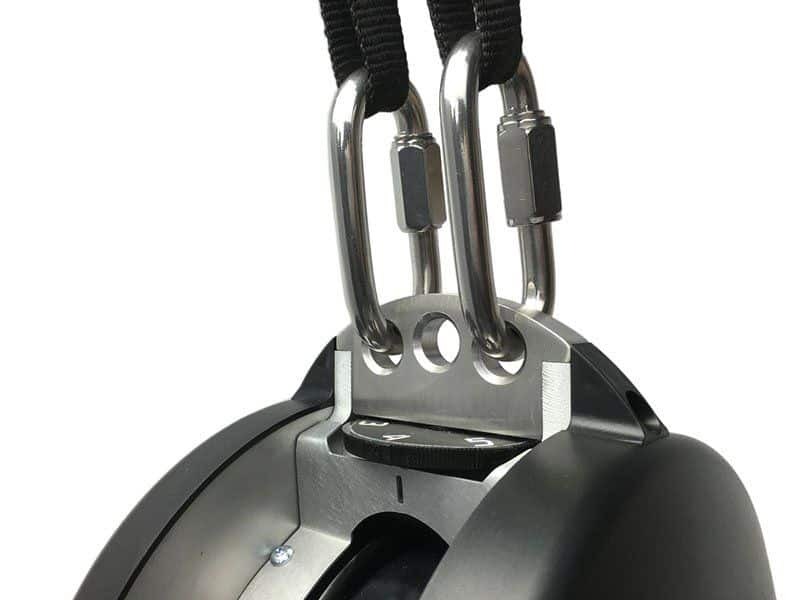 Additionally, thanks to the included anchor sling the revvll can be mounted in different heights which opens up even more different movements. What are the differences between revvll ONE and PRO? The revvll ONE is aimed at beginners and represents the perfect entry into endless rope training with its easier handling, the lower weight, and the extremely sturdy construction. The revvll PRO is the professional version that allows optimal training programming with its 6 pre-defined resistance settings. The longer rope and the rope transport make the training even smoother and allow a perfect flow of movements during training. You can see the main differences between the revvll ONE and revvll PRO at a glance here. What distinguishes the revvll from its competition? As of right now, the revvll PRO doesn’t really have direct competition, it is unique. It was developed as a space-saving, mobile, versatile, and reasonable alternative to common rope climbing machines which is why this comparison can be drawn. Rope climbing machines simulate climbing up a rope with an endless rope. The machines, however, are stationary and often only allow for one or to movement directions. Additonally, these machines are very expensive and, thus, only for big gyms an attractive addition to their machine park. The revvll was designed to address all these disadvantages. With its 4 m long endless rope it weighs less than 6 kg (13 lb), thus it is easy to transport and can be mounted in different heights. Depending on mounting height and the position of the trainee towards the revvll, there are different possible exercises with pushing, pulling, and rotating movements. And finally, the revvll PRO costs only a fraction of the aforementioned rope climbing machines which makes it an attractive option for personal trainers and small gyms to expand their range of training possibilities with an innovative and unique piece of equipment. How much space do I need for revvll training? The necessary training space for revvll training is relatively small. The revvll itself needs only little space, the rope and the trainee take up most of the training space. Deciding factors for the necessary training space are the mounting height of the revvll and the direction in which you want to train. The most training space is needed when the revvll is mounted a hip height and the trainee pulls the rope towards their mid region. This rope training setup would take up about 2.5 m of space. To the sides you should have 2 m overall to make every rotational exercise possible. In between these margins, all exercises can be done without any limitations. If the revvll is mounted higher or lower than hip height, or the body center of the trainee, then the necessary training space becomes even smaller. Distance to other training equipment: please note that the revvll needs sufficient distance to other training equipment like sling trainers or powerbands. Otherwise, these could be pulled into the casing of the revvll and damage it and get damaged themselves. Where do I mount the revvll? The revvll can be mounted in different ways of which we would like to explain the three most common options. Thanks to the included anchor sling and the anchor carabiner, the revvll PRO can be hung from almost any structure. All kinds of training rigs, cages, training frames are suitable as well as trees, monkey bars or other outdoor solutions. For a more stable mounting of the revvll we recommend using two carabiners. The anchor point must be able to withstand a tensile load of at least 300 kg (660 lb). Make sure the revvll has enough distance from the holding structure so the casing does not collide with it at any time during the training. If you mount the revvll near the ground, make sure to protect the revvll with, e.g., a mat to protect it from hard impacts. The rail Adjust is an adjustable railing system that is mounted directly to the wall. It allows for a fast and easy height adjustment of the revvll. Over a height of 195 cm (77 in), the revvll can be adjusted in steps of 5 cm (2 in). For customers that already have a verso360 training frame or want to expand their training space with a multi-functional training station, we can offer the verso360 T-Adjust XL which can be attached to every T-Stand (the vertical pillars of verso360 frames). Since the T-Adjust XL is designed as a versatile base for different training methods and equipment, for the revvll the revvll Base Mount is needed as well as the anchor point for the revvll. Should you have any questions about what the best mounting solution would be for you and your training space, we will gladly help you. Simply send us an email to office@aerobis.com or give us a call :(+49)(0)2234/9895290. We will be happy to help! Does the rail Adjust fit on my frame, too? If you already have a training frame that you want to install the rail Adjust on, we have the solution for you. With the Custom version of the rail Adjust you can install it on all frames with legs of at least 90 mm width. Should you be unsure whether the rail Adjust fits on your frame simply send us an email or give us a call! Which heights requirements do I have to consider when mounting the revvll? The mounting of the revvll can vary in height. Both a mounting near the ground and a mounting in head height offer many exercise variations. Different heights will make different exercises possible. Make sure, however, that the resistance wheel on top of the revvll is in reach for each of the trainees at any time so they can adjust the intensity of the training to their individual fitness levels. The rail Adjust is the optimal wall mount for the revvll. It allows for quick and easy height adjustment. The rail Adjust should be installed about 30 cm/12 in above the floor to enable all exercises and arrange for maximum movement radius. What is the resistance of the individual levels of the revvll? Please note: the given watt values are approximated values. The true traction powers can differ slightly. The resistance of the revvll ONE can be adjusted progessively up to the point of blocking the rope entirely. Caution: this can increase wear because the rope is stressed disproportionately. What do I have to consider when using the revvll? For a material-friendly handling we recommend a constant and steady pushing and pulling behaviour with moderate acceleration and decelaration of the rope. Sudden and explosive rope movements lead to a significantly increased friction between the revvll core and the rope. We further recommend using the rope in a way that it doesn’t drag over the floor. This would also increase wearout. What does smooth rope transport mean? Smooth rope transport refers to the behaviour of the rope immediately after it has been pulled or pushed. In this aspect, the revvll PRO and revvll ONE differ significantly in their handling. The rope of the revvll PRO runs on for a short amount of time after you have moved it over the axle in the center of the casing. This allows for a flowing movement and you can use the momentum of the rope when you continue to move it further. With the revvll ONE, however, the rope pratically stops right after letting it go. This behaviour requires a higher degree of strength to bring the rope into motion again. There can be several reasons for a static charge of the installation. One reason could be that friction from the carpet separates charges and the motion of the rope transports it to the revvll body. A static charge with the same potential of trainee, rope, and machine is also possible. When an uncharged person touches the rope, the charge can flow. A possible solution: trainees should always be grounded in order to prevent static charge or conduct it directly. You can achieve this by using ESD protection mats which are widely available. These mats are placed on the gground underneath the revvll so that the trainee can stand on it during training. The mat is connected to an ground conductor via a cable. These are general guidelines without commitment and must be verified with a specialist on site. How do I clean the revvll? This video shows you how to apply silicone spray and clean the rope to keep your revvll clean and ready to work out. You can also download these instructions here. What is the warranty of the revvll? We grant a 24 month warranty for all metal parts and a six month warranty for the rope, the rope wheel, and the guide wheel (wearing parts). We offer pre-assembled service parts with which you can replace every component of the revvll PRO without having to change the whole device. There is no special equipment needed for this. How can I exchange the rope? Within Germany you can send us your revvll PRO for service. We will change the rope for the price of the rope (209.90 €) and send you the serviced revvll PRO back free of charge within Germany. International: please contact the merchant or distribution partner in your country (see here). They will help you with your service case. Count on it – revvll PRO rope trainer with Rep Counter The revvll PRO now comes with a Rep Counter integrated into the rope. This not only makes your training measurable, it also gives you new possibilities to challenge yourself every day. Find out here, how revvll training in 2016 will look. 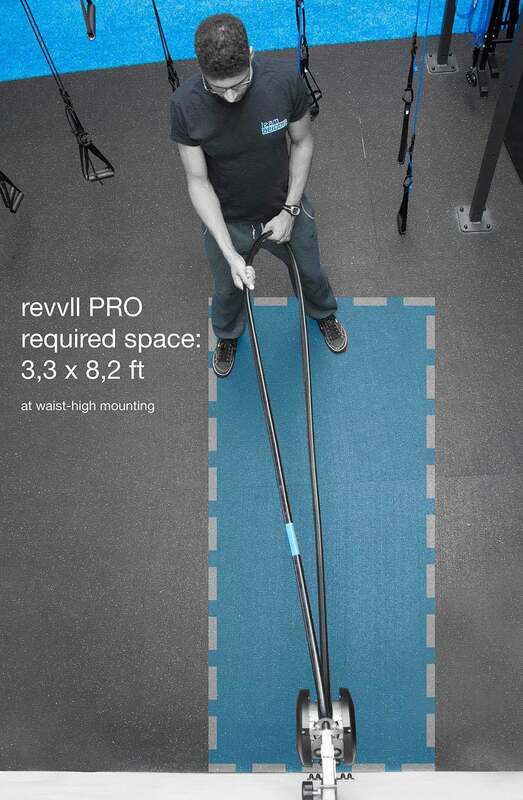 The most effective rope training – the revvll PRO The revvll PRO offers an unrivaled training. It offers significantly more exercises than you would guess at first sight. We show you what it is capable of in our video. Coach Oumar visits us & shows his favorite revvll rope trainer exercises (incl. video) this week is all about the revvll PRO, because Coach Oumar Chevara Camara drops by and shows us his favorite endless rope exercises.